Contrary to popular belief, cave exploration is quite safe if simple rules are followed and good judgment is employed. 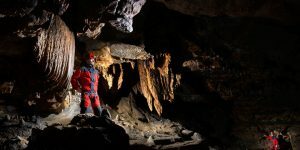 However, a number of potential hazards are involved in cave exploration, including obvious ones such as falling or getting lost as well as less obvious hazards. It is primarily the less obvious ones with which we will be concerned in this article. 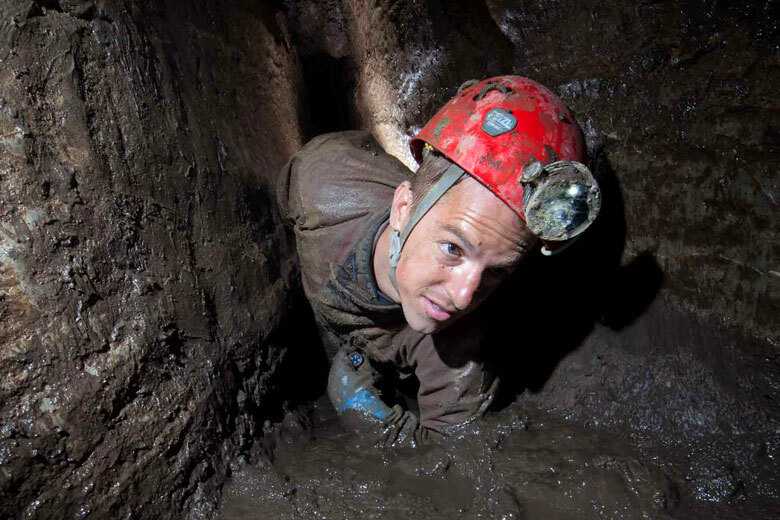 Getting lost in one of the major concerns of novice cavers. Fortunately it is a rare occurrence, although almost every caver who has been caving for any length of time has, at one time or another, been briefly disoriented. In the past, and even today, cavers occasionally encounter masses of entangled string weaving back and forth through a cave’s passages. This is a sure sign that a party whose members have had no introduction to cave exploration has passed that point at some time. If the cave is small enough that balls of string will reach its extremities, it is undoubtedly too small to get lost in anyway. When cavers retrace their route in order to exit a cave, the return route looks very different than it did while they were entering. The best method to follow in order to learn the return route is to turn around often while travelling inward in order to see what the passage looks like when headed in the opposite direction. If the party is still concerned about becoming disoriented, it is best to leave temporary, ecologically sound route markers, which should be removed in the course of the party’s exit. 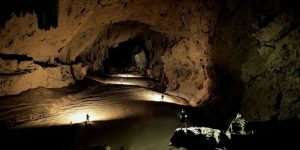 Many cavers who find themselves disoriented will have become confused concerning the route in large rooms or at junctions. Hence it is a wise idea to mark such places, either physically or mentally. Pay attention to distinctive formations and passage configurations. 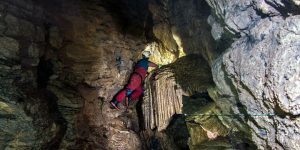 The use of a compass and a note pad for jotting down information regarding the route is a great help in extremely complicated or large cave systems. If your group finds itself disoriented, the best course of action is to sit down where you are. Once rested, and having discussed the situation and each person’s ideas as to where the desired passage is located, the party can then send out small scout teams in the surrounding area to search for the correct but elusive passage. This search should be organized with the teams reporting back to the central location according to plan. The correct route is often not the most obvious one. The disoriented party is ordinarily quickly reoriented after a systematic search. If you find yourself separated from the remainder of your caving party, you should sit down and think about your previous route. Turn your primary light down in order not to waste it, or if you have a candle, light it instead. Call out every few minutes and listen for sounds of the other members of your caving party. Undoubtedly you will be found quickly. At times you may want to use a systematic search pattern to find the main route, similar to the method used by the group. One should never cave alone, however, so if there is no danger of hypothermia, you should remain where you are and let the larger caving party do the searching. In frequently visited caves the main route is often easy to recognize because the rock is mud-coloured and at times worn smooth from caver traffic. The floor will Often exhibit paths and at times these may be deeply indented. Formations may be discoloured at about shoulder level, having been used as hand-helds by careless, muddy-handed cavers. In the past it was common practice for cavers to smoke or paint arrows on the cave walls to mark their route. This is no longer an acceptable practice, but these older markings may Still be encountered. The rule is that these arrows when placed should always point toward the nearest entrance. You should never trust these implicitly, however, as uninformed so-called cavers may have pointed them in the opposite direction. It is commonly believed that many caves possess air contaminated with one substance or another. 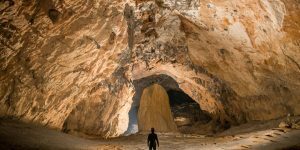 In actuality less than 1 percent of known caves possess bad air. In this section, in addition to contaminated air, we will be discussing cave air with abnormally high or low levels of some commonly occurring component. This is done for the sake of simplicity and with the understanding that in the strict sense of the word this air is not contaminated. Low levels of oxygen have been reported in some caves or cave portions-usually small slots or holes set down low. Carbon dioxide is heavier than oxygen; therefore, a caver breathing in oxygen and giving off carbon dioxide who is located in a depression with poor air circulation could conceivably reduce the supply or even deplete the air of oxygen. This situation is rare, as most caves possess good circulation (unlike many abandoned mines). The human body that does not receive adequate oxygen suffers from hypoxia, which is defined as a deficiency of oxygen in body tissues. Many individuals believe that a candle or carbide lamp will be extinguished due to lack of oxygen before the cover experiences any trouble in low oxygen level areas. This is not a good rule to follow as normal air possesses approximately 20% oxygen. Candles will be extinguished when the level reaches about 16 percent. Dangerous hypoxia begins when the level reaches about 15 percent, but carbide lamps have been known to burn in atmospheres possessing only 8 to 10 percent oxygen. Human death will occur at approximately the 7 to 8 percent oxygen levels. 5% carbon dioxide in the atmosphere is a high enough concentration to cause serious discomfort and prevent strenuous activity, although the human body can endure concentrations as high as 30 percent carbon dioxide when enough oxygen is present. Caves that possess large concentrations of bat guano sometimes exhibit high levels of ammonia, a by-product of decomposing guano. 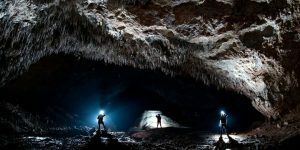 Due to its strong smell and the irritation it causes to the eyes, nose, and respiratory system, a caver generally is repelled by excessive levels of ammonia before he would ever be exposed to dangerous levels of the gas. Cavers active in guano and ammonia-laden caves should use a proper type of gas mask to filter the ammonia out of the air. Hydrogen sulphide, which smells like rotten eggs, contaminates the air of some caves. Such caves are most often located near geothermal activity. In areas associated with active or semi-active volcanic activity, the release of sulphur gases such as sulphur trioxide or dioxide has been reported. These gases are extremely dangerous, for when mixed with moisture, such as that of the eyes, throat, and nose, sulphuric acid is formed. If a caver detects the smell of sulphur, he should consider the cave off limits. 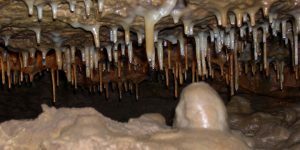 Occasionally a cave is found that has bubbles of gas, usually methane, trapped in the stream-bottom mud. These bubble up through the water to its surface and sometimes ignite in bursts of flame when carbide ear the water surface. Forest litter or other plant material, wash into the cave and lodged there, produces this flammable gas in the process of decomposition. More contaminated-air-related cave deaths have resulted from carbon monoxide poisoning than all other types of bad air combined. Carbon monoxide is lethal in extremely small concentrations, for it binds with the body’s haemoglobin, the oxygen-carrying molecule in the blood. Due to the fact that carbon monoxide binds with an affinity 230 times greater than does oxygen, the carbon monoxide effectively displaces the oxygen, causing death. In the absence of strong air movements in caves, carbon monoxide is produced and accumulates in the cave atmosphere when fires are built inside caves; hence the repeated admonition: do not build fires in caves. For cooking and heating of liquids, use a small backpack stove. An accumulation of carbon monoxide can also result if the exhaust of internal combustion engines becomes directed into caves. Guano has been known to ignite, and some reports of it exploding have been recorded. Never light guano on fire. In Arizona’s Grand Canyon, one particular cave possessing unique giant prehistoric ground sloth remains had its guano ignited by some careless cavers. The fire burned for months despite rigorous and expensive attempts to extinguish it. Large quantities of the scientifically priceless palaeontological remains were destroyed. Although caves are generally extremely stable, the area around the entrance sometimes has loose debris and rock. It is important that cavers pay proper attention to unstable rock and debris when entering caves, especially virgin caves. Accidents reported due to falling rock have often taken place in pits while a caver is ascending or descending. Cavers rigging the drop must be careful to rig in such a way that the rope will not dislodge rocks, and cavers at the top of the drop must be extremely careful not to knock off any rocks, even a small rock falling any distance and striking a cave: can cause severe injury or death. Caves are not mines and mines are not caves. Caves have been formed naturally over thousands or millions of years. They are generally physically stable and possess good air circulation. Mines, on the other hand, are artificial, man-made, and are constructed over a relatively short period of time. Mines are often extremely unstable and air circulation within them is often poor, with concentrations of poisonous gases not at all unusual. Few accidents occur in caves, but the same cannot be said for mines. Old, abandoned mines are dangerous and should be avoided. cases cave entrances without active streams receive heavy run-off from the surrounding area following rainfall. Check the lay of the land surrounding any cave entrance where you will be exploring to determine if such an occurrence is possible in that particular location. Piles of flood debris at a cave entrance are, of course, an obvious warning that the cave is subject to flooding. Inside the cave, leaves and debris trapped high up in a cave passage or room are good indications that that particular portion of the cave is subject to . flooding. While visiting a cave you should be continually aware of any indication that flooding may be occurring. Watch for increased foam at the base of waterfalls. If you do find yourself in a cave that is flooding, remain calm, quickly determine your alternatives, and choose the most favourable. If possible, exit the cave immediately. If exit is impossible, proceed to the highest level of the cave. Prepare to wait and guard against hypothermia.